Does school life really determine our future? Do we ever grow out of our school crush? Mischief Theatre play a classroom full of unruly kids and anarchic teens all the way through to the pains and aches of adulthood in their first new play since 2016: Groan Ups. Mischief Theatre have been making the West End laugh since 2014, when their debut show The Play That Goes Wrong tumbled into the Duchess Theatre where it’s still playing today both in the West End and on Broadway. Festive favourite Peter Pan Goes Wrong followed suit for a season at the Apollo Theatre in 2015. The company’s third show, The Comedy About a Bank Robbery opened at the Criterion Theatre in 2016 and still plays to packed audiences today. In addition to the theatre, the company have had two BBC Christmas specials: Peter Pan Goes Wrong (a televised version of the show) and A Christmas Carol Goes Wrong. Their shows have also toured the UK and are even playing internationally. Groan Ups is the first of three shows which make up the Mischief Season at the Vaudeville Theatre, where the company will be resident until August 2020. Groan Ups will be followed by Magic Goes Wrong and another yet-to-be-announced show. The Mischief Season will mark Mischief Theatre having three shows in the West End running simultaneously – a fantastic achievement! The cast includes the original Mischief Theatre line-up: Henry Lewis, Johnathan Sayer, Henry Shields, Dave Hearn, Charlie Russell, Nancy Zamit, and Bryony Corrigan. Direction comes from Kirsty Patrick Ward. 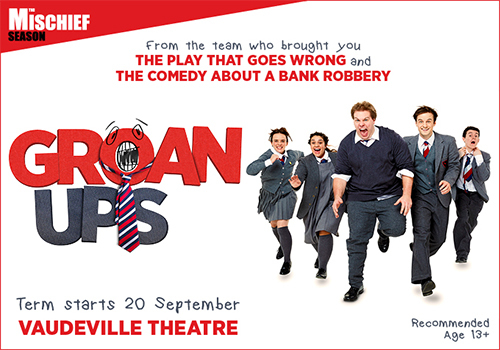 Groan Ups plays at the Vaudeville Theatre from September 20th – December 1st.